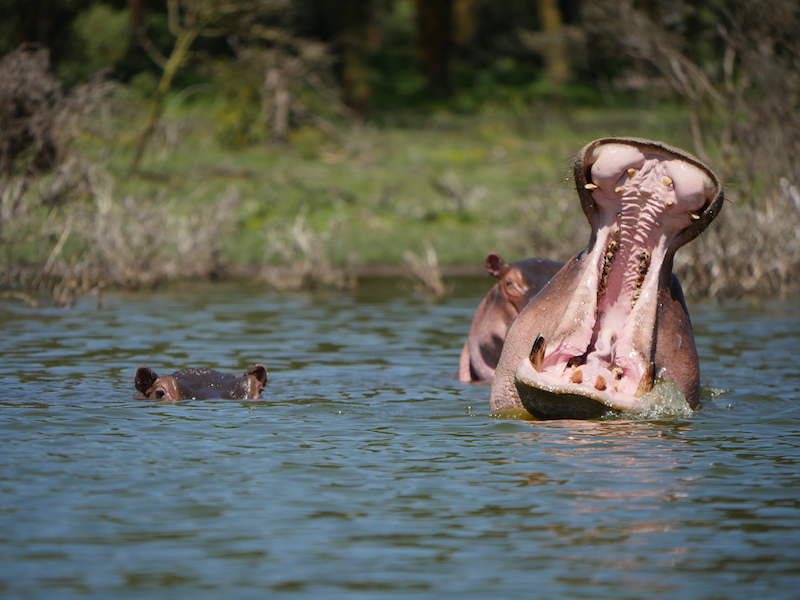 Once you’ve decided to head out on safari as a family, you will need to gear up. Here are my best safari packing tips for families and what you cannot leave home without. There are no affiliate links in this post. Just the items I found to be indispensable while we were on safari. Do not head to Africa without having the proper medicine. You can check out my vaccination guide here. Other than the standard Malaria pills, you will also need antibiotics on hand. For families with children, I strongly suggest bringing Children’s Benadryl and any other needed medicine for allergic reactions as they are very hard to find in Africa. The same holds true if your kids require Children’s Tylenol or Ibuprofen for any ailments. Keep these items in your carry-on with quality bug spray and sunscreen. Heading out on safari with kids requires you to rethink their clothing a little. To start, bright colours can deter animals particularly red. Secondly, you will want to stock up on a good pair of long pants and a hot weather long sleeved shirt to protect against the sun and mosquitos. We found the affordable Silver Ridge line of clothing from Columbia Sportswear met all of our needs. I was able to pick up convertible pants for everyone as well as long sleeve shirts that were comfortable even on the sizzling hot Masai Mara. The Silver Ridge line offers both Omni-Wick, a high-performance waking fabric to keep you dry and Omni-Shade, with UPF 40 sun protection. We have spent a lot of time in these clothes since returning and find that they are great for hiking. They are lightweight enough that we don’t get too hot and dry extremely fast. 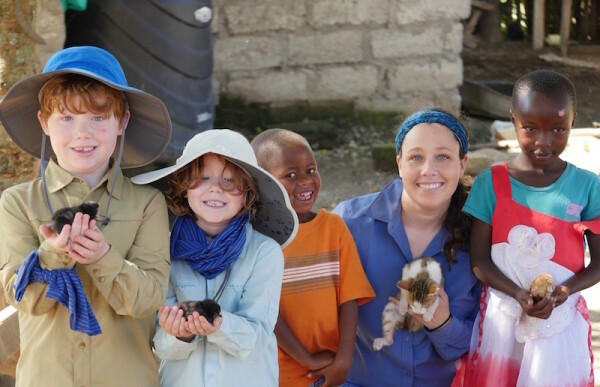 We were fortunate enough to get to do a walking safari with Intrepid Travel and found that sun hats were a necessity. Earlier this year, I randomly purchased the Kids’ Voyager Hat from Outdoor Research and now I can’t imagine traveling without them. 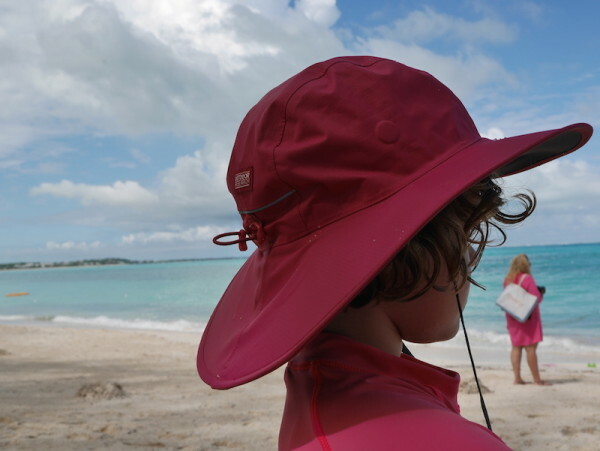 The hats provide incredible sun protection and are also waterproof. The best part is that they float making them a lot harder to lose in water. Before leaving on safari, I ordered a Cozumel Sombrero for myself and am just as pleased with it as I am the kids’ gear. I found it easiest to pack in a bag that was large enough for our clothes to be in one pack but small enough for me to carry. This meant being particular about what we brought and finding a good fit. I found that the Scrambler line from Mountain Hardwear met our needs and exceeded my expectations. The bags are waterproof and come in a variety of sizes. I carried a 35L bag but would recommend checking out their newest addition the Scrambler RT 40L. The bags are waterproof with a double roll top which seals out water. I also use the 30L now in all our travels as my carry-on bag on flights. It is small and light enough to carry comfortably and then I have it at the ready for any water or hiking activities. Good shoes will make or break your safari. I recommend purchasing them with enough time for your kids to break them in at home. Make sure to buy shoes that are completely waterproof as you never know where you may end up. 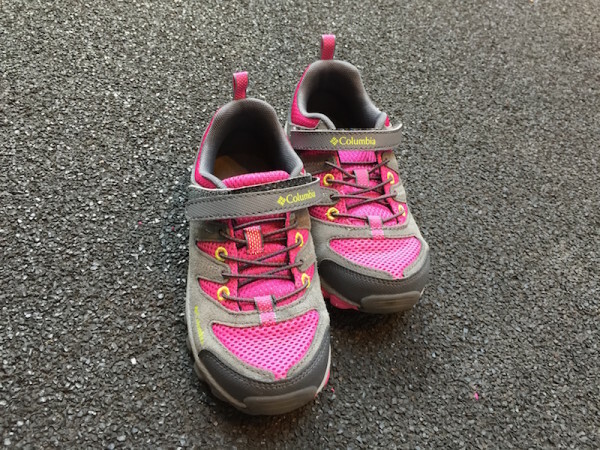 I find for my kids, the best fit and quality shoe we have found is the Youth Redmond Explore Trail Shoe from Columbia Sportswear. Frankly, they are also the best priced shoe we have found which doesn’t hurt when your kids having quickly growing feet. My tried and true shoe brand is Merrell. I have been hiking in them for years and find that they dry quickly and are light and comfortable. They also stand up well do muddy and slippery trails. If you have watched survivor, you probably know more than you need to about all the ways one person can wear a Buff. 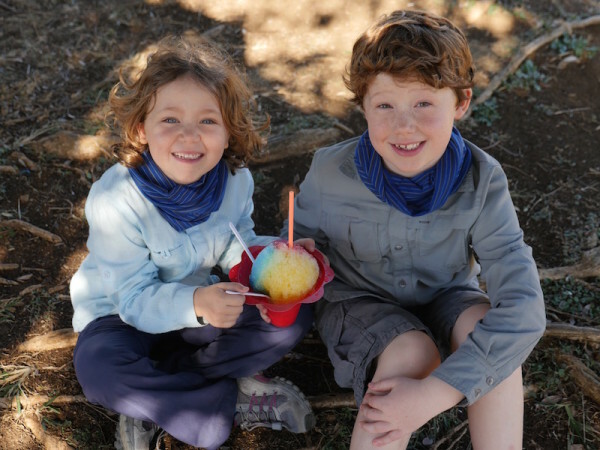 Besides making you look like a real survivor, Buffs are a necessity for kids on safari. We kept them around our necks providing extra sun protection and at the ready for when the roads got very dry and dusty. It was easy for the kids to pull the Buffs over their mouths, noses and even eyes when needed. These were really a lifesaver on our safari and now we bring them on all of our trips. 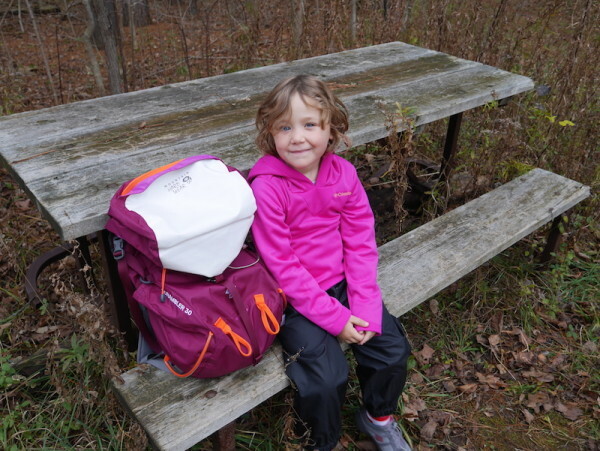 For small kids, check out the Junior Line from Buff which I found to be a much better fit for both of mine. No matter which camera you have, you will want to invest in some good lenses as well as a tripod. I travel with the Panasonic Lumix GX8 and can’t say enough good things about it. I found for this safari, I needed a series of lenses. I brought along a 12-35 mm lens, 35-100 mm lens and an indispensable 100-300 mm lens. The only thing I found was missing was a good wide angle lens. You’ll also want to consider packing a tripod. I brought along a Combo Tripod and Traveler Bag from Fotopro. The bag was big enough to pack the three lenses and my camera and the tripod is extremely light. I still carry the bag and tripod on all our trips. A warning – I very easily broke one of the zippers on the bag and thus do not want to recommend it without disclosing all the information. For the trip, the bag was awesome and having the tripod made for some incredible photos. I was able to unfold the portable tripod and use it from the safari vehicles. For daily use, I would look into purchasing a tripod separately from Fotopro and a higher quality bag. Here is a printable packing list with all you need to get started on your safari! 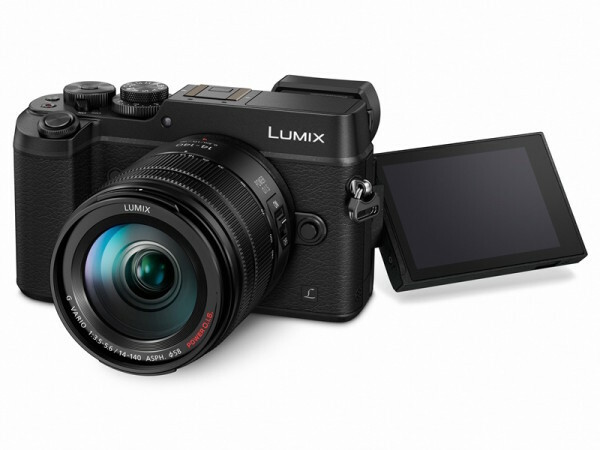 All photos included in this blog post were taken with a Panasonic Lumix DMC-GX8. To learn more click here.